Our new TUFF SRC branding serves to distinguish our inflatable boat coatings from other non-marine paint products. BLAINE, WA, May 30, 2018 /24-7PressRelease/ -- Synergy Research Corporation has changed the brand name of its flagship inflatable boat restoration product line from Tuff-Coat to TUFF SRC. In conjunction, the firm has re-launched it's direct to consumer online store at https://tuff-src.myshopify.com. "We have been successfully marketing our brand of inflatable boat restoration coatings for over 16 years," states Michael Fry, owner of Synergy Research Corporation and inventor of TUFF SRC. "Our new TUFF SRC branding serves to distinguish our inflatable boat coatings from other non-marine paint products and sets the stage for a complimentary line of new TUFF SRC products for the inflatable boat marketplace. The new online store takes advantage of the Shopify Platform to improve the buying experience for TUFF SRC customers. "While our old shopping cart did the job, it was time to move to a more modern e-commerce platform," says Fry. "It made sense to launch our new shopping platform at the same time as we announced our new product brand name." The new online store launches with the TUFF SRC brand. The improved design and navigation will help customers better determine which product to order, how much to order and how to apply the coating to restore their Hypalon or PVC dinghy. "Our market-leading inflatable boat restoration products have not changed under the new brand," states Michael Fry. "TUFF SRC continues to be the only proven coating that is successful in restoring damaged inflatable boat tubes." Synergy Research Corporation manufactures and distributes restoration products for the marine industry. The privately held company invented a number of products including its unique inflatable boat paint under the original brand of Tuff-Coat. TUFF SRC™ is a two-part inflatable boat coating system that is applied directly to PVC or Hypalon fabric. The TUFF SRC Basecoat is formulated to rebuild and restore the original fabric. The TUFF SRC Topcoat is designed to bond onto the Basecoat. Topcoat is available in the 5 most common colors found on Inflatable boats such as Avon, Bombardier, Brig, Caribe, Zodiac, and others. TUFF SRC is made available through a number of sales partners and at the company's online store at http://www.tuff-src.myshopify.com. 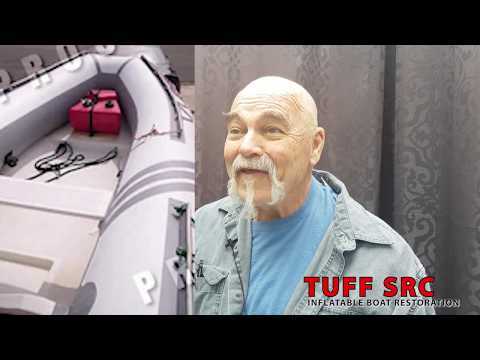 Michael Fry, Owner, and Inventor of TUFF SRC tells the story of how he discovered his inflatable boat restoration coating product.